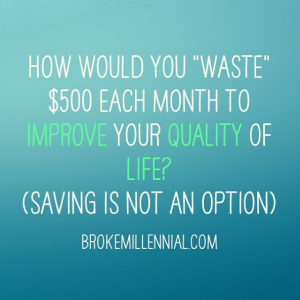 How Would You “Waste” Money to Improve Your Quality of Life? You know that game you play when the Powerball skyrockets up to some astronomical amount and your co-workers start to collect $5 from everyone to buy tickets? The old “what would you do if you won the lottery?” song-and-dance in which one person says they’d keep working, one person acts all benevolent and says she’d donate it to charity and then you’re honest and say you’d quit your job, buy a few homes, travel a bunch and then get tired of everyone you ever knew asking you for a loan. Considering that the odds of you winning the lottery are pretty much non-existent and many folks end up blowing it all in a few years anyway – I quite prefer this practical question posted on an episode of The Tim Ferriss Show podcast. Tim used $2,000 a month as this sample discretionary fund to put towards improving his quality of life, but let’s say you’re not a multi-New York Times best-selling author and angel investor with a successful podcast. $2,000 sounds like a beautiful sum to squander, but $500 felt a more realistic amount for many millennials. So, for the fun of hypothetical questions though, I posed Tim’s question to Peach with both the realistic sounding $500 level and then the fingers-crossed-one-day-in-the-future amount of $2,000. There was one catch: he couldn’t use the money to invest, save or pay off debt. We batted our ideas around for a while. Peach focused his funds on increasing his ability to see his family by either flying them to New York City or him taking regular routine trips back to his hometown. He took the improving quality of life from a mental health perspective. I opted for the money to improve my quality of life by outsourcing chores I despise like meal planning and cooking, thus freeing up time similar to Tim’s initial point in the podcast. “Basically – what would you do if you didn’t have to make student loan payments…I think about this all the time…Sigh” one of my friends wrote on Instagram. She’s right, many people will eventually have an extra $500 a month by paying off debt or earning raises via traditional jobs or generating more income in freelance life or starting a side hustle. Unfortunately, you might not realize you’ve got that spare $500 or even $2,000 around to allocate towards improving your quality of life because of the slow creep of lifestyle inflation. By the time those student loans, credit cards, personal loans or car payments are handled – will you still be living far enough below your means to enable the spending of $500 to improve your quality of life? Or, if you’ve always been a freak about handling your money and never been in debt (like me), will you be able to get your mind out of the intense frugality headspace in order to justify “wasting money” in order to improve your life. As a New York City dweller, I do not have the luxury of a washer/dryer in my apartment. Instead, I must walk the 500 feet (thank goodness it’s close) to my laundromat at the end of the block. Because I’ve gotten close with the owners after more than five years of doing business with them, I just dump my clothes in the washers, go home, return in 27 minutes to move my laundry to the dryer, go back home and return in 56 minutes to fetch my clothes. Typically, I dump them all in my laundry bag and head home to fold. Scintillating, I know. Due to a series of events two weeks ago, I found myself folding laundry at the actual laundromat on a Wednesday night. In the 20 minutes it took me to fold my laundry, there must’ve been about eight people who popped in to pick up their freshly laundered and folded duds. It felt as if I was the only person on my block that actually bothers to do my own laundry instead of dropping it off. It would probably cost me about $20 each week to get my laundry washed and folded by the pros. Even though I can return home while my laundry is going, it’s hard to get much done in 27 minutes and then an hour later I’m interrupted again to return and halt to fold and put away my clothes. This is a long-winded way of telling you, I rationally know it makes more sense for my time value of money to just pay for the laundry service, and yet I struggle with actually pulling the trigger. My mind makes excuses about how there’s a lot of clothing I hang dry or that I like everything washed cold and only dried permanent press and what if they mess up something of mine and then I’m out that money? Pretty pathetic reasons to not ‘waste my money’ on something that will improve my quality of life. Due to a large amount of travel, this month consists of only 8 full days home in New York City. Plus, the second draft of my book is due mid-month. So, what better way to force myself into using a laundry service than by doing it at a time when I feel it’s highly justified because I need every extra moment possible to get work done or just take a moment to relax? Next week is the test, so we’ll see if testing the waters this month can lead me to “waste” some more money in the name of outsourcing menial tasks and improving my quality of life. How would you spend $500 to improve your quality of life? Smart move, Erin. As you know, my income has recently been reduced. However, I’m still spending $55 a week to work with my personal trainer. My progress is slow, but I’m feeling a lot better. Prioritizing wellness is something I struggle with, and I’m sure it will pay off in the long run. Kate! I love that you are investing in yourself! and Erin, for me it would be spending it on personal growth. I love masterminds and I would go to more conferences and events! Such an awesome question to put forth! I would probably use the money for a food delivery/meal preparation service & laundry handling (since I don’t have a washer/dryer either). Or I could use to get a better non roommate apartment! My first thought was basically a mix of all the things mentioned above. But when thinking about it more I thought “what would be my eccentric answer?” and I went directly to taking classes to get a pilots license. I’ve always wanted to do that, I know it’s expensive but spreading out the time it takes to get certified I think that $500 a month could slowly get me there. Most of the cost is just renting a plane and fuel. The apartment I am in now is the first time in four years that I haven’t had an in-unit washer and dryer. I *despite* going to the laundromat. I would rather wear a dirty sports bra for three days at the gym than go to the laundromat (nasty I know). I was spoiled for so long! I’m too cheap for a service though. I’ve started bringing my computer so I can write blog posts. At least I can use the time effectively. I always found it inconvenient when the washer and dryer was not in the unit. Even if it was just around the corner. Ugh. I’d absolutely pay the $20 to have it done for me. I’d equate that to how I probably over-spend on my meals by frequently getting take out or prepared food from the grocery store rather than cooking stuff myself. What I find super interesting about the results of your crowdsourcing survey on this is just how many of responses were completely selfish. And my own answer to you was no different. Daily Dinner Chef! Weekly massages! Would the answers be different? I know mine would be. And i’m going to tell you why. If you changed the goal posts on me and told me that I had to stop contributing $500 per month to my investment portfolio and that I couldn’t park it in my bank account, I simply had to get rid of it every month. Would I go crazy on indulging in weekly massages? I don’t think that I would. Because now we are talking about my money, not imaginary money. I want my money to make a difference in the lives of people I both care about and don’t know. I think I would feel far too guilty using it on myself. Most people feel a lot better about themselves when they use their money to help others. I would probably in fact give it to worthy charities and/or buy gifts for people who I care about, because I’m perfectly content on my existing lifestyle. With a monthly massage. Weekly would be great, but I’d feel a lot better using it elsewhere. I think my point is that it’s a helluva lot easier to spend money that isn’t actually in our pocket….which is to say, how practical IS the question? I wonder if part of your unwillingness to outsource your laundry isn’t just the 100% paranoia that they won’t do it exactly the way you like it, but because self-indulgence feels pretty awful living in a world full of debt-ridden peers who are struggling? Great question. Because saving is so ingrained in my brain, it’s hard for me to think of ways to spend $500. If I couldn’t invest that money, I would probably spend it on investing onto my blog that I have currently. I have never actually considered doing so before this post, wow. It really got me thinking. I might have some rethinking and re-decision making to do 🙂 thank you for the post! I had a similar problem at first because my instinct is also to save or invest it! That’s part of the reason I put the disclaimer about it having to go elsewhere so all us PF nerds had to think outside our boxes. The struggle is definitely real. It’s really about weighing decisions, which one is to do or to pass. Yes! My parents got me an epic milk froather for Christmas last year and I’m all about making my own tea lattes and cafe au lait now. Yup, that’s why I used the quotation marks and Tim Ferriss even verbally acknowledged air quoting the word waste in his podcast when he posed the question. The point is more that the general population or people you know could view it as wasteful, but to you it isn’t. I’m going to a Broadway show with my boyfriend tomorrow night and I definitely don’t see that as wasteful, but I know I have friends that do when he could’ve spent the cost of the ticket on putting more towards his student loan payments. That’s a great question. I’ll have to think of it more because I can’t come up with anything right away. Life is already pretty good and I don’t see how $500 more would improve it. We could eat out more, but that wouldn’t be a huge QOL improvement. It’d be less healthy which is bad at my age. Anyway, good choice with the laundry. It’s pretty awesome that you’ve hit such a strong QQL that $500 wouldn’t do much. What about $2,000?! He definitely says $5k in the episode I heard. I only know because I blogged about it last week–not like this though! I love that you suggested everyone do the exercise. The farthest I got in my blog post was trying to wrap my head around that insane number ? Whoops! He also mentions $2,000 because that’s the sum he wish he’d spent on the flight to Australia. But yeah, $5k is also pretty insane. But if I had Tim Ferriss money that’s the way I’d think too! I do love how much guests struggle to answer the routine “$100 purchase or less” question. My Dad’s locked-and-loaded answer is his Amazon Prime subscription! On the other hand, maybe that 27 minutes could be used effectively on all those tiny little tasks that tend not to get done because they’re annoying or you think you’ll eventually get to it. You could make a running list of things that take about 5-10 minutes to complete (paying bills, sewing on a button, chopping vegetables for snacks for the week, etc) and save them for that 27-minute window. You would get things done, save money, and give yourself more long stretches of time in the rest of the day to actually concentrate on the longer tasks. While that’s true, most of those tasks are already lumped into other ways I currently navigate time. I do temptation bundling for food prep (i.e. I get to use that time to watch shows while I prep food for the week) and I have standing budget meetings with myself on Sundays. To me the time spent folding the laundry is also the biggie that I like saving and is well-worth the money. $500 hmmm. Realistically, I would pay for more convenience in my eating. CSA+grocery delivery and more restaurant meals. I’m with ya girl! I have the same problem! It’s two hours essentially of my week that I need to block off to get it done. I can’t do it every other week either as I don’ have that many clothes! I think there’s a difference between using money to improve your quality of life and using money to grow your lifestyle. It sounds like many of these examples are suggesting the latter. In America we’re blessed with many things that already give us a better quality of life than people around the world–water, food, shelter, etc. Additions like a personal trainer, chef, laundry service, etc., are nice, but they aren’t necessarily frugal choices, even if you’re debt-free and financially independent. Hmmm…. I think I’d use it for more travel-related stuff. I’d go camping once a month over a weekend. And like many others have said, I’d probably buy better food. I’d surely get fruits and blender so I can have all smoothies I want in my life. Unfortunately I spend $60 for a membership to a chain massage place that I signed up at a few years ago. The only way I can cancel this membership is to either loose all the massages I’ve already paid for, and haven’t used (at this time about 6, at $60/each) or to use all those massages and cancel before they run my next month’s billing cycle. It’s extremely frustrating. I go back and forth on what I should do. Agh. Sometimes, the quality of time you get is much more useful compared to the $20 saving. I am leaning towards spending money towards a meal prep service. That way I’m not spending time worry about what to eat, let alone the time to actually prepare it. Plus if I pick a healthy plan then I’m getting healthier too! I love the idea of a fun fund. It contains the damage while keeping debt repayment or savings going. Life is meant to be enjoyed! Think of it in a slightly different way. What is your time worth. 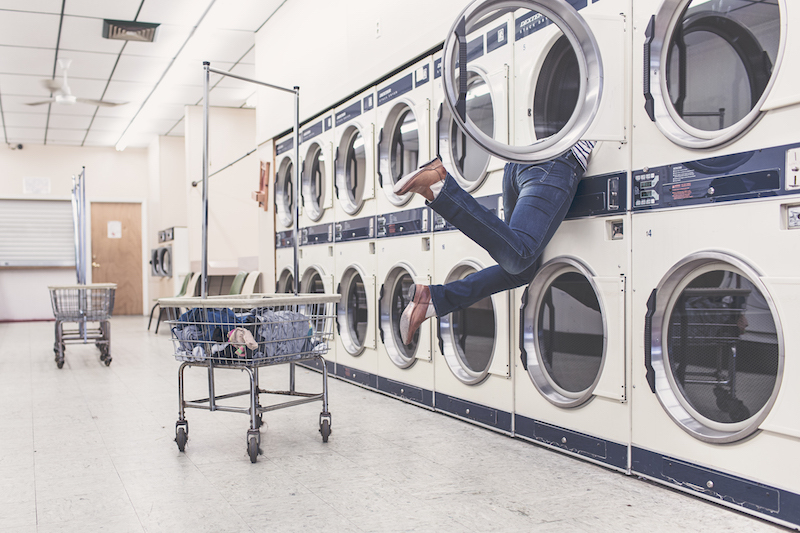 If you pay for the laundry service and then use that same hour to go do something that earns you more then the laundry, then you’ve still come out ahead. Time has an opportunity cost. In my personal life when my wife worked full time as well we had a house cleaning service. Why? Because without it our time with our kids was so low due to work that we’d have to cut back on work otherwise. The value of the 3hrs of time exceeded the 3 hrs cost. I would probably pay someone to cut the grass! It is hot as hades in my area, so that would really be nice! We’d probably also relocate to the pacific north west of the US. The extra $$$ a month would probably be spent as monthly mortgage since real estate tends to run higher in that area. We have a housekeeper come every 4 weeks. It costs $120 and I wouldn’t give it up in exchange for anything else I can think of! The peace of mind that $120 buys me is priceless! There are lots of ways to have more quality of life. I’d surely spend some money on massage or a good haircut if it makes me feel more good about myself. I would have to agree with Holly on the housekeeper. Being a single parent I can’t always spend enough time keeping the home well kept. If I were looking for ways to cut back on spending this would not be one I would even consider stopping! Thank you, Broke Millennial, for a great article but it very difficult to answer you as you asked “How Would You “Waste” Money to Improve Your Quality of Life?” It very person to person, choice to choice. I am almost same as James. This is such a cool and thought-provoking question. I think I’d probably buy some activity related gear each month that would then give me the options and ability to participate in sports or extracurriculars whenever I wanted. IE buy a snowboard one month, a paddleboard the next, hockey gear, you get the idea.